The eleventh and twelfth incarnations of Blago Bung, the intergenerational avant-garde performance poetry cabaret series that has delighted audiences in America and Europe since 2007, will be performed in late October in New York. 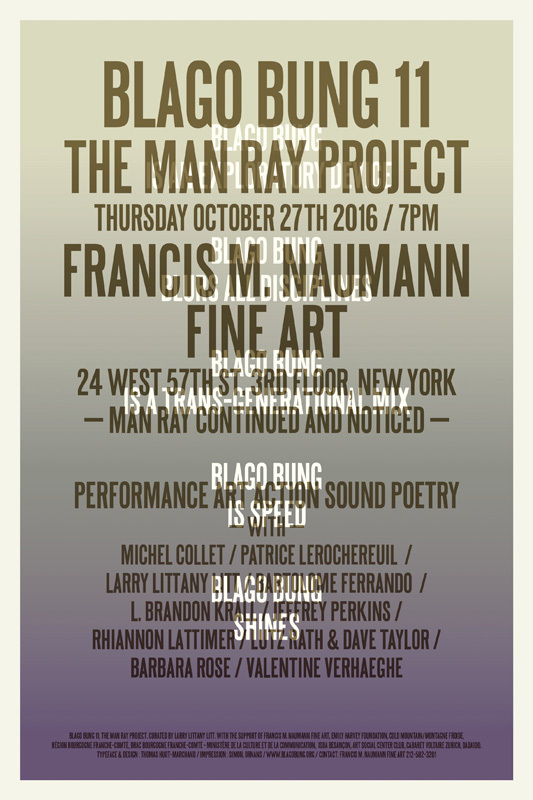 Blago Bung 11, The Man Ray Project, will take place on Oct. 27 at 7 p.m.
at Francis M. Naumann Fine Art, 24 West 57th Street, Third Floor. Blago Bung 12 will be presented in two parts, on Oct. 26 and 28 at 7 p.m.
at the Emily Harvey Foundation Gallery, 537 Broadway at Spring Street, Second Floor. All shows are free and open to the public, no reservations needed. The title “Blago Bung” is an expression derived from the “Karawane” poem of Hugo Ball, a poem of rhythms and sounds, psalmody in proximity to the sacred and close as well to the grotesque, in breaking away from language. "Blago Bung" is also a creation out of national languages, at Cabaret Voltaire, where the historic avant-garde developed as a meeting place for artists in passage – as are the artists of all Blago Bung events. They were immigrants in a time of disasters, speaking several languages. Blago Bung visits these issues of the hybridization of language, of sonorities, of the arts, poetry in action, voice, presence, gesture, exceeding the boundaries between the arts that might appear as a promise, the invention of new forms, foreign, finally the activation of experiences, of thought experiments, and a certain de-specialization. Inspired by Stéphane Mallarmé, who opened literature to avant-garde and intermedia devices, Michel Collet conceived of Blago Bung as a cultural bridge between Europe and America. Curated by Collet and Patrice Lerochereuil in 2007, Blago Bung's first performances as well as most subsequent ones were presented at the Emily Harvey Foundation Gallery, itself a genius loci founded by Emily Harvey, whose prime mover, George Maciunas, staged a few rare events there. Acknowledging the advice of the French artist Jean Dupuy, Collet, along with Valentine Verhaeghe and Larry Littany Litt, have developed the Blago Bung model so as to place artists at the center of all facets of their work as organizers, eliminating the traditional hierarchy and freeing them to experience the concept of production as art and to experiment. Blago Bang is a “meta-écriture,” in which every artist presents actions, dance or no-dance, art and no-art, performances, poetry, video, sound works. The pieces unfold quickly, come together randomly and collectively, imparting a character of diverse tonicity and joy. Audiences experience free association, dream weave, the society imagined by Charles Fourier. The dynamic is to be present, irrepressible, linked to theoretical research, play, philosophy, politics, aesthetics, poetry and movement on an unpretentious stage for poetry performance. BLAGO BUNG 12, CURATED BY MICHEL COLLET & PATRICE LEROCHEREUIL.